The Aeris Android SDK allows a developer to quickly and easily add weather content and functionality to their android applications. It utilizes the Aeris API backend for data loading and is built on top of an object mapping system that efficiently loads requested weather content into third-party Android applications, greatly reducing the amount of code and development needed on the developer end. 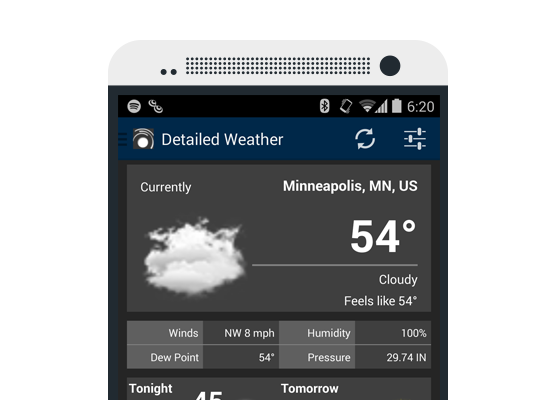 To get started using the Aeris Android Weather SDK, first review the system and platform requirements below. Now we're ready to take a look at the libraries that make up the Aeris Android SDK on the Getting Started page. Following that, you'll want to review the installation documentation for instructions on how to set up your project to use the SDK. Once you have the SDK installed, be sure to review the demo project that comes with the downloaded SDK. It's a great way to see examples of the SDK being used in actual code. Thanks again for using our Aeris Android SDK - happy coding!